Sheffield Steelers have lost the battle to stage the Continental Cup final on home ice - and must travel 1,530 miles to Belarus instead. The ice hockey governing body awarded Yunost Minsk the right to host the 2018 IIHF Continental Cup Final. Logistically it looks a nightmare for Steelers - who were crushed 7-1 by Minsk in the qualifying round. Gone is the possibility of bringing revenue to both Sheffield and the Steelers. In fact, it could be a costly exercise to send the squad to the far-flung eastern European country. The tournament will take place 12-14 January 2018 at the Chizhovka Arena - bang in the middle of a hectic domestic EIHL programme. 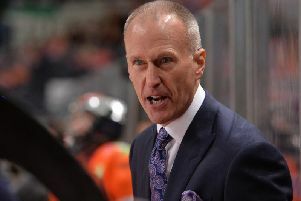 Steelers will have to re-arrange their planned January 13 meeting with defending Elite League champions Cardiff Devils. Minsk beat Steelers not only on the ice but in the bidding process to bring the final to their 9,600-seat arena. Yunost finished the preliminary undefeated with the best record - but it was still hoped Sheffield would be a more attractive venue for the concluding series. The Chizhovka venue though is only four years old and was used as one of the sites for the 2014 IIHF Ice Hockey World Championship. The complex includes two ice sheets. The team that is currently in second place in the Belarusian Extraliga has won the Continental Cup in 2007 and 2011 when it already hosted the final once. Kazakh champion Nomad Astana won the other group in Ritten, Italy, and advanced to the final together with the second-ranked hosts. The four teams will play for the Continental Cup’s ‘winner plate’ at the round-robin tournament in Minsk. The Continental Cup winner will get the chance to play in the Champions Hockey League 2018/2019.